Lawn Sprinkler Systems Installations, Vancouver, BC Instant Lawns. Residential Irrigation for lawns and gardens. Lawn Sprinkler Systems, Installation Vancouver, BC. Residential Irrigation. Customers please note: WE INSTALL NEW LAWN SPRINKLERS BEFORE YOUR NEW LAWN IS INSTALLED. USE THE FORM TO GET AN INSTALLATION ESTIMATE. To get a quote on a lawn sprinkler install please use the form at the bottom of the page, we will call you back shortly and arrange an onsite estimate. Looking to install a new lawn sprinkler system? We specialize in lawn sprinkler / irrigation repairs, installations and maintenance. For new installations our team can design, install and maintain your new lawn sprinkler system making sure you get the water where you need it. Your new lawn sprinkler system will be fully automated and is installed with a irrigation control box for multi function time setting. All of our systems are installled with back flow preventors, an inspection will be required to ensure the work is completed properly. All of our new sprinkler system installations are backed by a warranty covering parts and labour. Rain Sensors: Rain sensors prevent your irrigation system from turning on when its raining. Water Saver Sprinkler Heads: Reduce your water usage and save money on water with water saving sprinkler heads..
Damage Prevention Sprinkler Heads: Prevent property damage from a broken head. These sprinkler heads are designed to limit water flow if damaged. Drip Irrigation: Water your plants in hanging baskets and pots with a drip irrigation add on. Lawn area and garden bed separate watering schedules: Save water and water within the lawn sprinkling regulations with a garden and lawn area separation. Outdoor Landscape Lighting: Beautify your landscape with our low voltage landscape lighting systems. Normal annual maintenance includes: Irrigation system shut downs, annual start ups and system cleaning. To avoid damage from frost during winter months, sprinkler systems should be blown out annually. Repairs and additions to existing sprinker systems can be completed. Outdoor lighting looks fantastic, highlighting key elements of your landscape to create a stunning atmosphere long after the sun has gone down. Additionally, proper outdoor lighting can deter would be trespassers and thieves. We are ready to bring a little light to your landscape and show you what you’ve been missing. Keep your yard protected, and stunning, with outdoor lighting. 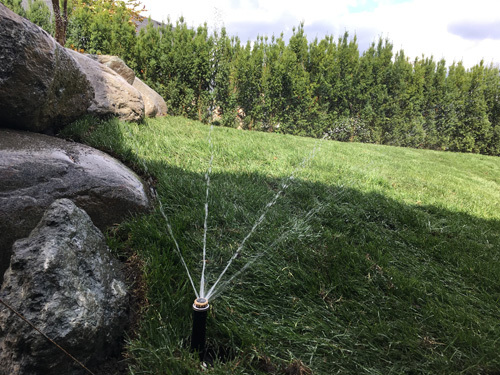 To get pricing for your new sprinkler system from BC Instant Lawns and Landscapes, call us to arrange an on site estimate or use the form on this page and we will call you back to discuss details. For more information about BC Instant Lawns and Landscapes services you may also visit our online store. Looking for a new lawn irrigation system / sprinkler system in Vancouver, BC.. Call BC Instant Lawns and Landscapes.